Ali Salif and Hesam Ronawaz perform the song 'Nafisa'. Ali, 31, comes from Ghazni, Afghanistan and plays dambura. He has been a refugee in Greece since 2009. Hesam, 22, comes from Kunduz in Afghanistan. Here he plays tabla percussion but also plays the traditional Afghan stringed instrument the rubab. He studied music for 8 years, and has been a refugee in Greece since 2010. ‘Nafisa’ is based on a traditional Afghan music composition. The lyrics were written in 2010 by Ali Salif for Nafisa, his loved one, while he was being held in a detention centre in Athens, Greece. The performance was recorded at the Greek Forum of Refugees in Athens. More information about refugees in Greece. In the isolated region of Bajo Atrato, Colombia, live thousands of adolescents and adults of African and indigenous descent. The indigenous communities have remained secluded here for centuries and the Afro-Colombians are descendants of Africans brought to America as slaves. Fleeing from the armed conflict elsewhere in Colombia, they settled in this area and created an ambitious but highly effective project called the Inter-Ethnic Youth Leadership School, which prepares the youth for one goal: to defend their residence in these territories. Despite the uphill challenges, 30 leaders from the Interethnic Youth Leadership School devised and created the publication 'Remembering Our Story' in which several communities, ethnic authorities, parents, grandparents, children and youth united to tell the world what has happened to them in the past and how they are joining hand in hand to move forward towards a lasting peaceful solution. Here, Alex Perea Palacios sings a song in praise of the Inter-Ethnic School. More information about refugees in Colombia. Los Calimas are brothers Christian (17) and Alejandro (16) Hincapie, refugees from Colombia. This love song was written in tribute to a friend of the brothers. The word ‘Calima’ means indigenous people in some countries of the region and was used prior to the colonization of the Americas. The brothers named themselves ‘The Calimas’ in tribute to their roots and hometown of Cali, Colombia. The group ‘The Calimas’ has another member, a Panamanian friend of the brothers whom they met when they arrived to Panama three years ago. After fleeing Cali, they spent almost three years in Panama waiting for recognition of their refugee status. The song is two years old and is the first song the brothers wrote. The video was recorded in Panama at the Panamanian Red Cross facilities, the UNHCR’s partner in the country. More information about refugees in Panama. Ousmane Ag Oumar was born in 1989 in Niono, Mali, he is a member of the Kel Ansar tribe. His musical home is the Touareg band Imarhan. 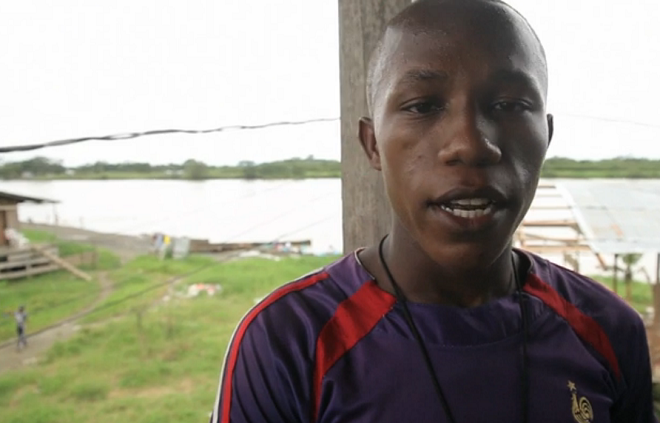 In 2012 he was forced to break off his university studies to leave Mali. He fled initially to Mauritania, and later to Burkina Faso. Arriving in France in September, 2014, he made an asylum application to the Office French Protection of Refugees and Stateless Persons (OFPRA). He is waiting for a decision. Ousmane, in the song 'Legh Tanna', Ousmane uses music to express his inner pain and to describe the suffering of the Tuareg people following Mali's independence in 1960. (Video submitted by Christopher Nolan/Clermont Music, 2015). More information about refugees in Mali. Vincent Calissa, a refugee from Rwanda, became a Romanian citizen in 2012. He performs the song 'Kuku'. As he explains, the song originates from the Ivory Coast and Mali and was formerly sung by village women coming home from fishing; they would use fishing implements to beat the rhythm. “This is dedicated to the women in the family, and I play it as a tribute to my mother” says Vincent. More information about refugees in Romania. Sierra Leone's Refugee All Stars is a band from Sierra Leone. It was formed by a group of refugees displaced to Guinea during the Sierra Leone Civil War. Since their return to Freetown in 2004, the band has toured extensively to raise awareness for humanitarian causes. After the documentary film about their escape to Guinea and the forming of the band, ('Sierra Leone's Refugee All Stars', 2005), SLRAS now perform hundreds of concerts all over the globe. This video was made under improvised conditions when the band arrived in Amsterdam from the US, as part of a tour - the next stops were Spain and La Reunion. The musicians were extremely tired after spending the previous night stuck in Istanbul airport; the guitar was borrowed from a nearby shop, drums were not available. Nonetheless the artists were more than willing to sing for 'aLive'. “UNHCR helped us a lot”, says head of the group, Reuben Koroma. More information about refugees in Sierra Leone. The members of My Dream fled from the Democratic Republic of Congo and Angola, to find refuge in Ukraine. Efun Dindi Noda, Déborah Masamba, Morris Tshibangu, Nadia Beinkiand and Marianna Nkiavette divide their time between work and study. They love to improvise on themes from their native Africa - their song ‘Nuso Ozomona’ / ‘Everything Changes’ is an appeal for multicultural dialogue. The members came to Ukraine in early 90s from various African countries affected by civil wars and military conflicts. Band leader Marianna Nkiavette (39) arrived from Angola in 1992. The one-time bazaar merchant became a university student with genuine interest in intercultural issues. “I'm only one step away from making my dream come true!” says Marianna. She will very shortly obtain her university diploma in International Information from the Open International University of Human Development in Ukraine.They play music to show how people can find common ground and live peacefully in harmony. More information about the situation in Ukraine. The members of El-Mangu are cousins, brothers, sisters and extended family. They fled South Sudan in early 2014 and managed to finally reach Kenya. Describing their journey, they say “We spent three days looking for water and faced lots of other challenges, but somehow managed to cope. We lost a lot during this time - some of us lost their parents. But music helps us, gives us hope and motivates us." More information about refugees in Kenya and South Sudan. In this video we see Wissam Alali, who arrived in Italy from Syria. Along with many others, Wissam travelled on a ship which became lost in the Mediterranean. He jumped into the sea and began to swim. Eventually picked up, he led his rescuers back to save his companions. Once he arrived in south Italy he headed to Milan, arriving at Milan's central railway station like many migrants before him. There he met volunteers who helped him find his feet. The video was recorded at the station (submitted by Stefano Vergari). More information about refugees in Italy. Having fled conflict zones twice in his lifetime, Dima Ivashchenko finds relief in music. Born in Azerbaijan, of Ukrainian/Armenian/Azerbaijani heritage, he has lived most of his life in Ukraine. Dima is 32 years old, and lived in the eastern Ukrainian city of Donetsk until military hostilities caused the displacement of over 1.3 million citizens. He left Donetsk in May 2015, but this was not the first time that he has fled military conflict: the 7 year-old Dima and his family initially fled Azerbaijan following threats of violence towards Armenians. He now dedicates his life to music and wants to make a new start in Kyiv following his successful performance in Ukraine’s most popular TV show, The Voice. “I sing whenever I`m happy, sad or even desperate. Song is my relief. The song I perform here is a Ukrainian national song, and dates back to the XVIIIth century". Nayim Alal was born to a nomadic family at the Ued Hawa, near Smara, Western Sahara Territory in 1966. In 1975, he fled with all his family to Tifariti, then Mahbes and finally Tindouf. When he finished his studies in the camp school, he had to do military service, where he learned the accordion and acoustic guitar. He subsequently joined the SPLA (Sahwari People's Liberation Army) in 1986, as part of the Sahrawi military band. In 1997 he was moved back to Tindouf, where he joined the musical group Wilaya of El Aaiun when he left the Army. He joined the Sahrawi band Leyoad in 1998, which toured Europe presenting the album Mariem Hassan con Leyoad. In 2003, he released his first solo album, sung in Arabic and featuring his electric guitar. He is considered one of the innovators of Western Sahara's traditional hawl music, and his work has been added to the World Music National Geographic database. The character of some of Allal's lyrics is politically highly charged; they reflect the uncertainties which Western Sahara has faced in recent years. Currently Nayim Alal lives in the Sahrawi refugees camp of Rabuni, near Tinduf, Algeria. (Video submitted by Nubenegra, ℗1998). More information about refugees in the Western Sahara Territory. Born in Ued Tazua, Mariem Hassan, has lived in the Smara camp of Western Sahara Territory refugees in Tindouf/ Algeria from 1975-2002. There he died of cancer on August 22nd 2015. Between 1978 – 1988 as a member of El Wali, she performed political songs, protesting about the situation of the Sahrawi people. As a member of Leyoad, she performed in Europe and in 2004 she founded her own band. In 2005, her first solo album was released. 'Deseos' ('Wishes') was Hassan's personal interpretation of traditional Haul music. She was the subject of a 2007 documentary film ‘Mariem Hassan, la voz del Sáhara’; in 2013 she completed a Sahrawi oral history project ('Cuéntame Abuelo – Música') and in October 2014, Calamar Edicion y Diseño published her official biography. This performance was filmed in the Rabuni refugee camp in southwestern Algeria in January 1998. Born in Western Sahara Territory, Mahfud Aliyen (56) is the best-known singer of the Sahrawis. He has been living in the Sahrawi refugee camp of El Aaiun, Algeria, since 1975. As a member of El Wali, he played in numerous music events and performed in Europe as a member of Leyoad. At present his health is delicate due to the conditions of the refugee camps and the extreme climate of the Algerian Hamada where the camps are located. Despite this, Mahfud is participating in an ambitious project to safeguard the Sahrawi oral tradition, entitled 'Tell Me Grandpa'. Mahfud here incessantly repeats the name of his loved, madly proclaiming his anxiety and beating the rhythm on his chest with his hands. This video was recorded in the Rabuni refugee camp in southwestern Algeria. Singer/ songwriter Johnie Kak is 22 years old, a refugee from Burundi. At the age of two, Johnie fled Burundi together with his parents and seven older brothers and sisters. He came to Kenya via Tanzania, and has lived in the Dadaab refugee camps since 2008. Dadaab is the biggest refugee hosting complex in the world. The five camps are close to the Kenyan-Somali border and host a total of over 350,000 refugees, mostly from Somalia. “I picked the song because everyone needs peace. It helps societies to grow and people to go back to their countries. Love brings people together and makes them live in harmony. Especially for Burundi, love and peace are needed. Music is my life. When I am stressed and tired, I just listen to music. It is something in my blood, something I have been doing ever since I was little.” The video was recorded in Dadaab, Kenya. More information about refugees in Kenya. The European Broadcasting Union (EBU) in cooperation with UNHCR offers aLive, a multi-media project to mark World Refugee Day on June 20th 2015. Via the EBU network, video and supporting documentation will be available to broadcasters for selection and incorporation in their own programming and websites. Refugees were invited to select and perform material of their own choice. The songs recall their homelands, lost lives and loved ones, or express hopes and fears about new developments in the changed circumstances of their lives. Sheltering in the shadow of an unpainted house in the Algerian desert, a guitar-toting man grimly blasts out a cascade of atonal electric blues; in front of Milan’s central station, a young man celebrates his narrow escape from drowning during his flight from Syria; in Athens, two Afghans sing of lives and loves left behind. Refugees may leave their physical possessions, but their songs express who they are and where they come from, and will stay with them wherever they go. On World Refugee Day, June 20, the UN Refugee Agency UNHCR commemorates the strength and resilience of the more than 50 million people around the world forced to flee their homes due to war or human rights abuses. Audio-visual material performed by refugees from Afghanistan, Columbia, Mali, Rwanda, Sierra Leone, South Sudan, Syria, Western Sahara Territory. Filming took place in Algeria, France, Greece, Italy, Kenya, Panama, Romania and Ukraine. Performers: Najm Allal (Western SaharaTerritory/filmed in Algeria), Mahfud Aliyen (Western Sahara Territory/ filmed in Algeria), Vincent Calissa (Rwanda/Romania), Christian & Alejandro Hincapie (Colombia/Panama), Hesam Ronawez (Afghanistan/Greece), Johnie Kak (Burundi/Kenya), El Mangu (South Sudan/Kenya), Nkiavete Nan Mariana, Ousmane Ag Oumar (Mali/France), Alex Perea Palacios (Colombia), Saray (Colombia/Venezuela), the Sierra Leone Refugee All Stars (Sierra Leone/USA), Mariem Hassan (Western SaharaTerritory/Algeria) and Wissam ALili (Syria/Italy), among others. Performances and accompanying text/documentation form the 'aLive – music by refugees' project of Rundfunk Berlin-Brandenburg (RBB), realised in cooperation with the World Music Workshop of the EBU and the UN Refugee Agency UNHCR. For over a quarter of a century, Afghanistan has been devastated by conflict and civil strife. The country has been the largest source of refugees for more than three decades, at peak (1990-91) recording more than six million refugees, mostly in Pakistan and the Islamic Republic of Iran. By mid-2014, at more than three million registered refugees, Syrians had overtaken Afghans as the largest refugee population, a reflection of the continuous conflict and violence in the country. The overthrow of the Taliban in 2001 resulted in one of the largest and most successful return operations in history. Since 2002, more than 5.8 million Afghan refugees have returned home, 4.7 million of whom were assisted by UNHCR. Representing 20 per cent of Afghanistan's population, returnees remain a key population of concern to UNHCR. Refugee returns have dwindled during the past five years and owing to insecurity and a difficult socio-economic situation, only around 10,000 refugees returned during the first seven months of 2014. It is anticipated that the newly-formed national unity Government will demonstrate commitment to creating an enabling environment for sustainable returns. The withdrawal of international security forces, as well as a complex economic transition are, however, likely to affect peace, security and development in Afghanistan. Humanitarian needs are not expected to diminish in 2015. Support and assistance from the international community will be essential to ensure a transition towards more stable development. An estimated 550,000 people fled Angola during the country’s 14-year struggle for independence and the ensuing civil war that came to an end in 2002. The country has since reached a state of peace, and in 2012 UNHCR recommended that the refugee status of those who fled the country’s armed conflicts could be ended. While most refugees had already returned to their homeland, efforts were stepped up to find a solution for the more than 73,000 people who remained the different countries of asylum, mostly the Democratic Republic of the Congo and Zambia. Some of them decided to return to Angola while others will be allowed to stay. In Colombia, a complex, long-lasting humanitarian crisis persists. As the government moves forward on its peace negotiations with illegal armed groups, the impacts of the conflict on the civilian population continue. The armed violence caused by the actions of illegal armed groups, whether the traditional parties in the armed conflict (guerrillas) or the armed groups which arose after the process to demobilise paramilitary groups (2004), has created a devastating humanitarian impact and represent a threat to the protection of civil society. These actions take the form of numerous violations of Human Rights and infractions of International Humanitarian Law, including homicides, forced disappearances, forced displacement, acts of gender violence and, in particular, sexual violence, kidnapping, land theft, anti-personnel mines and torture. Colombia is second in terms of the number of internally displaced persons at the worldwide level, behind Syria. UNHCR is working with authorities and communities to promote sustainable solutions, especially local integration, as more than half of registered internally displaced people (IDPs) reside in cities and are unable or unwilling to return to their communities of origin. The Rwandan Genocide of 1994 and the ensuing conflict provoked a mass exodus of over two million people from the country. However, over the past few years, thousands of refugees have returned to Rwanda and another 10,000 are expected to do so in 2015. In recent years, Rwanda has also been hosting large numbers of refugees, mostly from Burundi and the DRC. Somalia has faced ongoing internal violence and political instability since the central government collapsed in 1991. As of July 2014, there were more than 1 million Somali refugees in the region, and an additional 1,100,000 were internally displaced. However, with hopes of greater stability in Somalia, some IDPs and refugees from neighbouring countries are spontaneously returning to some areas of origin. UNHCR has formed the Return Consortium, consisting of UN agencies and international NGOs in Somalia. The consortium promotes a standardized approach to assist returnees and seeks synergies to facilitate voluntary return, with the aim of safe and sustainable reintegration of returnees in Somalia. The outbreak of conflict in South Sudan that started in December, 2013 has forced hundreds of thousands to flee their homes. A state of emergency has been declared in South Sudan’s Unity and Jonglei states and the conflict has now spread to seven states across the country. The world’s newest nation is now one of the world’s greatest humanitarian crises, with more than 2 million people displaced either inside their country or as refugees in Ethiopia, Kenya, Sudan and Uganda. Many are arriving malnourished and in poor health, having come from areas of South Sudan experiencing critical food shortages. As the Syrian conflict enters its fifth year, millions of refugees are caught in alarmingly deteriorating conditions, facing an even bleaker future. With no political solution in sight and military confrontation continuing, most of the 3.9 million Syrian refugees in Turkey, Lebanon, Jordan, Iraq and Egypt see no prospect of returning home in the near future, and have little opportunity to restart their lives in exile. Inside Syria, the situation is also deteriorating rapidly. Millions of children are suffering from trauma and ill health. Thousands of Syria’s schools and hospitals have been damaged, destroyed or taken over for shelter. UNHCR provides basic and necessary humanitarian aid for Syrian refugees and helps the most vulnerable refugees with urgently needed relief - cash for medicine and food, stoves and fuel for heating, insulation for tents, thermal blankets and winter clothing. By helping refugees in the surrounding region, UNHCR hopes to reduce the number of desperate Syrians resorting to smugglers and falling prey to traffickers in their efforts to reach safety elsewhere. Humanitarian needs are on the rise in Ukraine as the situation in the east remains tense and internal displacement tops 1,300,000 people in June 2015. The majority of registered IDPs originate from the eastern regions of Ukraine, while a small share come from the Crimea. Most IDPs choose to remain close to the conflict-affected areas, namely in government-controlled territories in Donetsk and Luhansk regions, as well as in the Kharkiv, Zaporizhzhia and Dnipropetrovsk regions. The economic downturn, coupled with limited employment opportunities, lack of clear prospects and movement restrictions has put more strain on people who were forced to flee their homes. Displaced persons need support with shelter, food and basic household items as well as proper healthcare and psychosocial services. The hostilities in the eastern regions and the deterioration of the economy also negatively affected the life of over 6,000 refugees and asylum seekers that have arrived in Ukraine seeking international protection prior to the conflict. The majority of them are from Syria and Afghanistan. Some refugees who had settled in the east of Ukraine were repeatedly relocated with their families, seeking safety within Ukraine. As many displaced lost everything, the most vulnerable largely rely on humanitarian assistance and support from communities and volunteers. While there has been enormous generosity from the host communities they are themselves under immense strain due to the fragile economy and rising inflation. Vincent Calissa: He is part of a band called IKHAYA (the other members of the band are NOT refugees), this is a promo video of his. On 17 April 2015, Islamic State of Iraq and the Levant (ISIL) burnt the musical instruments of the young Palestinian pianist Ayham Al Ahmad, reported Syria Live Network. Ayham Al Ahmad is well-known for his music expressing the tragedies of the Syrian war, which he has performed amid the devastated buildings in the Yarmouk Palestinian refugee camp, located south of Damascus. According to SLN, ISIL burnt the instruments on Al Ahmed’s birthday, on the day he turned 27 seven, causing many of his social media fans to ask for promoting and supporting his songs everywhere. Many sources indicated that the ISIL people who burnt his instruments were refugees from Yarmouk who joined ISIL recently. Dima Ivaschenko and his performance on the Ukrainian version of the tv show “The Voice”.